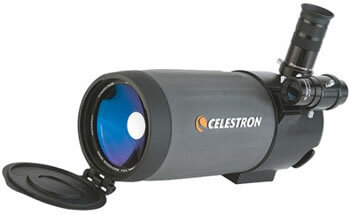 The Maksutov 90mm optical design is both portable and a high resolution design that is easy to use and has a variety of applications, making it an excellent choice for both terrestrial and astronomical usage. This C90 Mak has excellent optics with razor sharp images over a wide field. This instrument is capable of revealing extremely fine detail on the Lunar surface as well as for detailed study of nature and wildlife - highly recommended. Supplied complete with eyepiece, finder and carry bag ready to attach to any standard photo type tripod.